Unfortunately, it will be a while before we see native browser support for the spec, but that doesn’t mean developers can’t start taking advantage of the component concept now, thanks to Google’s Polymer framework and Mozilla’s x-tags polyfill library (both X-Tag and Polymer share the same low-level, Web Component polyfills). Want to edit how the component behaves, such as by adding navigational controls or pre-selecting a date? Like any other native tag, you can change how a component behaves just by changing the attributes of the tag! At the time of writing, Brick consists of thirteen different tags, most of which are completely independent of one another, and can even be downloaded separately instead of a single bundle. <x-tooltip> (exactly as it sounds). which polyfill <input type="range"> and <input type="date">, respectively. Still others are structural components simplifying the styling and markup of certain components, such as <x-layout>, which ensures that content, headers, and footers can fill a container element without explicit styling markup. Want to start using components in your own applications? Head to mozilla.github.io/brick to download a release bundles, view demos, and read the documentation for the available tags. Alternatively, visit the Brick Github page to view the source code and contribute to the effort! The library is still in a beta release, so we appreciate all user feedback! Brick is already starting to crop up in the wild, so we’d love to hear about how you’re using it! I am a Mozilla WebDev Intern working with the Apps/DevEcosystem team for Summer 2013. I'm currently a student at Carnegie Mellon University, where I study Computer Science/Human Computer Interaction. XUL components are powerful, but limited to Gecko rendering. Brick (and the Web Component specification) is a particularly nice re-invented wheel. Imagine if we still trundled on wooden spokes! Reinventing the wheel is a good thing. If done well, technology evolves, but either way it is representative of passion to move forward; to fend off complacency. I actually pose this question in interviews to see how the person thinks to get an idea of culturally, as well as technologically, how the candidate thinks. There’s a happy medium to be had, but we simply cannot throw iteration to the wayside. Fair enough, but there is a difference between iteration and discarding what has come before. Part of this comes down to, are the skills that you use with this technology useful for the next iteration, or can they be mutated some how to become useful with this next iteration. Otherwise, this tech is nice to play with, but is not production ready. Has there been any discussions on how to handle media-query type functionality in web components yet? It would be good to get that baked in from the start! This is something we’re thinking about actively. Some components will definitely benefit from different styles at different screen sizes- for instance. Think more of RESS instead of RWD. I’ve never used XUL so can’t comment, but there will be a case where needs to be different for devices and surely native support for this would be better. Would you guys recommend using Brick on Firefox OS? Yes, definitely – we did a Firefox OS workshop this weekend in Porto Alegre, Brazil and I taught everyone about Brick with a demo app. Perfect use case. @Angelina: Is your demo app somewhere available? Is it running on an actual device or in the emulator? I was there, at the end my team ended up with twitter bootstrap. We were in a rush and I was working on the REST backend so I really don’t know why they took that decision. Now I’m redoing the app from scratch and decided to give brick another chance. Definitely! We’re building the components for use in any webapp environment, Firefox OS included. How is the web component x-calendar better than using HTML5 form type=”date”? Will they ultimately generate the same calendar picker by the OS? Or will the generate a free-standing calendar that is independent of an input? 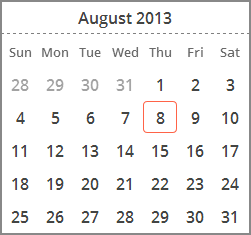 For datepickers, we actually provide a tag that uses x-calendar in the way you describe. Essentially, it will default to using the native input type=date element if the browser supports it, and it will generate a standalone polyfill otherwise. You also have the option of forcing the polyfill to render in case you want a consistent UI regardless of native support. datepicker and slider are polyfills, so we will fall back to the native input[type=date] and input[type=range] whenever the system provides a native version of the controls. 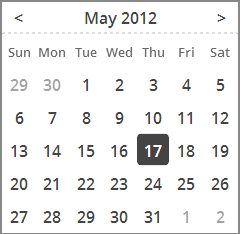 Calendar provides a standalone calendar independent from an input. We are working with the Mozilla accessibility team to ensure that by stable release, Brick components will be highly accessible. If you see any issues in particular with accessibility please let us know. x- stems from “x-tag”, Mozilla’s web components polyfill + library (http://www.x-tags.org/). The web components standard that all this is built on requites a dash to be in a custom element name. This is very exciting and long overdue! I am so happy to see a sensible UI solution like this is emerging for the web. Will definitly give bricks a try. Thank you for this great article! They are very similar to ng-directives in the ability to provide new functionality via markup. However, the interface to these components is independent from any framework. In fact, you could easily mix Brick components into Angular apps, and interface with them using angular.element just as you would any other HTML element. Finally Web developers will have the power of componentization to increase chance of better performance and better code quality. On the other hand, Apache Flex took that step 9 years ago, problem just remains on FP for render. Hope soon Bricks becomes a standard to the market. Finally, you’ve caught up with IE 5’s behaviors! My thoughts exactly! But it was 5.5, not 5.0, and they’ve been removed in IE10. Happy to finally catch up in a way that works cross-browser and is open source! 1.) What happens if you load two components, both of which use a library such as jQuery, does jQuery get loaded twice? 2.) Will we see these components being abused much like the jQuery plugin era where inexperienced developers where releasing badly written plugins by the truck load and we had plugin overload. Imagine a junior developer deciding to write their own calendar widget by loading in the full fat jQuery as well as jQuery UI and then releasing that as a Web Component. Disastrous performance implications for doing that. That second point isn’t a problem with Web Components itself but definitely a concern worth having regarding where this will lead in future if the developer community is not given the appropriate guidance on what NOT to do with this feature. Regarding point 1.) I’d love to know how this scenario is (or will/should be) handled? 1) The core Brick components all share a common dependency core, which is only included once in a bundle. If you’re pulling in additional components or individual Brick elements, they will be available on Bower, a js/css package manager. Bower handles dependency management, and will only download a given dependency once even if multiple components require it. 2) The beauty of the web is that you’re free to write code, good and bad. Brick as a component library/bundle will try to lead by example, establish best practices, and curate our components to a set that behaves well together. Interesting. How does one begin to integrate this type of markup with something like Ember or Angular? I guess this could replace jquery? I can’t keep up with all these new developments. This doesn’t seek to replace jQuery, though it could easily replace jQuery UI. Brick serves to sit along side existing web frameworks and is designed to work seamlessly with them by exposing all its functionality via the DOM as opposed to a new proprietary API. For example, to interact with an x-calendar in jQuery, you could say `$(‘x-calendar’).attr(‘chosen’, ‘2013-08-27’);` and that will work exactly how you would expect! The ‘Custom Element’ and ‘Web Component’ monikers get conflated a lot, but yes, technically we’re working with the Custom Elements portion of the spec. Awesome, this could be called HTML6! No need for external libraries like jQuery UI to make widgets, just type plain HTML tags, e.g. : x-tabbar, x-slidebox, x-slide, x-accordion, x-tooltip, x-modal, x-datepicker and run brick.js. I hope it will be compatible with Polymer UI Elements. There will never be an HTML6, as the HTML spec will just continue to evolve agnostic of a version number. Hence the new doctype with no versioning defined. No, the HTML spec is numbered, the latest being HTML5.1: http://www.w3.org/TR/html51/ so eventually there will be HTML6 and it may consist of custom elements such as web components. The key thing is that without a doctype, there is nothing to distinguish an HTML6 doc vs an HTML5. My advice for an html processor is to just assume that every tag you don’t know is something that could be legitimate. After all, there might be an update to the html spec while you were on vacation. Why can’t you just fast forward the process of building better common widgets into HTML5? It’s completely ludicrous how much the community bangs on about the open web as a ‘platform’ when there’s so few meaningful tags standardized and supported across all browsers. How long have datepickers been available to desktop developers as a simple widget? Probably three decades and yet these are still not available natively in HTML. Instead browser developers place their focus on all sorts of other areas. HTML5 is such an over-hyped standard in that it’s really very under-ambitious when it comes to expanding the number and quality of simple tags available to developers. Well, just HTML wasn’t meant for web apps, but for web pages. Hence a lack of builtin complex widgets, although a datepicker is available as an input tag. Others you can build from basic tags like divs and buttons. Second, HTML is a static language, so you have use JS to add behavior (even if it’s hidden inside an x-tag). Keep in mind, that the web is backward compatible, so you have to rely on JS. I think x-tags and web components are steps in a good direction, towards more modular web pages and faster loading times (components should be cached).